Anton Pusinelli was a pediatrician to the Saxon court in Dresden, but he is known as the lifelong friend of Richard Wagner. Pusinelli financially supported Wagner over and over again and in total lent him 5.000 Taler that were never returned to him. Together with his wife he stood by Minna Wagner during the last years of her life. In 1876 he was present at the first Bayreuther Festspiele. At his deathbed his thoughts were still with Wagner, who died five years after him. 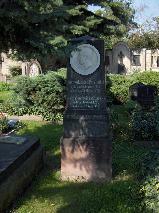 The grave of Anton Pusinelli at the Alter Katholischer Friedhof, Dresden.